Are we surprised by joy or by sorrow? The world in which we live wants to surprise us by sorrow. Newspapers keep telling us about traffic accidents, murders, conflicts between individuals, groups and nations, and the television fills our minds with images of hatred, violence, and destruction...But these surprises paralyze us and seduce us to an existence in which our main concern becomes survival in the midst of a sea of sorrows. By making us think about ourselves as survivors of a shipwreck, anxiously clinging to a piece of driftwood, we gradually accept the role of victims doomed by the cruel circumstances of our lives. The great challenge of faith is to be surprised by joy. In case you can't tell by now...this is not going to be our typical kinda review right here. And I know you don't need me to tell you this, nor is this what would normally be expected on an otherwise lighthearted blog, and you might have even came here for at least a momentary retreat from it all (diversion is one of our standard services)...but this past week or so has been especially punctuated by tragedy. Reading or watching the news has been akin to taking a Chuck Norris roundhouse kick right to the gut. Incredibly sad. Overwhelmingly awful. Impossible to grasp. And perhaps, most sadly, another chapter of tragedy in seemingly increasingly violent times. It's so easy (and perhaps even, in a way, therapeutic) to point fingers and pontificate and ascribe theories and arguments in all the aftermath. Just flip on the TV or read the papers. Everyone's a pundit, every politician knows the real answer...and on and on with the news cycle, waiting for whatever is next so the past can be discarded as yesterday's headline. It's beyond tiring. I'm not here to rehash all of that in any further detail - this is neither the space nor the forum. I really don't want to be just another voice out there getting lost in the cacophony of noise and opinion. 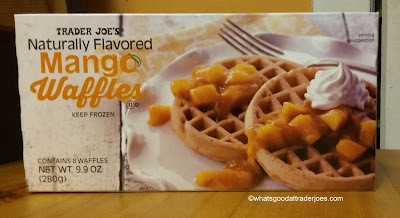 So instead, I'm going to leave you with a plea, and to help make my point, I'm going to use Trader Joe's Naturally Flavored Mango Waffles. Namely: Look for joy, and be willing to be surprised by it. It's Father's Day weekend when I'm publishing this. To say I've been blessed by the gift of two loving, happy, healthy daughters is an understatement. Both M (almost 4, with the attitude of a 15 year old) and B (19 months, loves copying her big sister and making a huge mess) challenge me, provoke me, love me, and continually show me that I somehow have more patience than I thought I did while proving that I still don't have enough. Love them kiddos. Love everything about them. Particularly love having breakfast with them almost every morning before I have to scurry off to my cubicle for the day. It's my daily centering, my peace. In turn, M and B love waffles. Originally, I was going to try and "interview" them as "waffle experts" for this post. It was going to be soooooo cute. Problem is, B is only at the very beginning stages of mastering discernible English vocabulary and M, well...sometimes we tease her that we have to take her to the doctor to figure out what happened to all her words. If she doesn't want to talk, she won't. And she didn't want to talk waffles with Daddy. So, idea scrapped. Admittedly, I was pretty bummed. But then...I saw their faces as they happily chomped into their mango waffles and clamored for more milk. Bright eyes. Biggest smiles. Bulging dimples. They were in the moment, and they were joyous. I grabbed my waffle and bit into it. Typical plain freezer waffle with some slightly sweet mango pureed in. Nothing too special. But after all the recent and outside worries and inside day-to-day stress...I needed that joy. So dang it, I pretended that was the tastiest waffle I've ever had, and let out a big, goofy, happy "YUM!" What followed: giggles, little voices letting out their own big, goofy YUMs, silly sound effects. In short, one of the happiest breakfasts a dad could ask for with his two young daughters. All three of us were in the moment, and it all seemed so...real. One of the most glaring facts of life is, no matter how much precaution and safety we try to bubblewrap ourselves and our loved ones in, is that anything can be taken away from us at any time, without warning, and there's not a single damn thing any of us can do about it. Whether it's health or relationships or people or possession, it can all be gone so fast. It only seems unfair when it happens to us, but we all fall under this burden. We can choose to be ignorant of this, to be paralyzed of it...or to acknowledge it, and to live the best we can with what we have. I urge the third option, and to make it easier: find joy. Even if it's in something small like a child's delighted exclamation for having mango waffles for a second morning in a row ("HOORAY FOR MANGO WAFFLES!!!"). This is the good part of life, if we're willing to be open to it, if we can allow ourselves to be surprised by joy amidst all the humming strife. That is what is real. Please find something, anything, that makes you as joyous as these waffles made my kids and me. Breakfast and a life lesson for $2.49. Good deal. Well written, cut! And it has been a sucky week. Great post and great sentiment! Thanks for this. It's been a rough week for me, and your words really resonated with me. Thanks for the much-needed reminder to find joy in the midst of pain. Thank you for this reminder. What a beautiful way to start your day....! This is beautifully said. What a great reminder of good, simple life.